Like most bloggers I take a lot of photos. Photos of recipes, my latest projects or even great thrift shop finds. But like any mom, family photos are the most important photos to me. For all the pictures I take, I have to admit that our walls are very bare! I've yet to hang a single snapshot of my adorable, little girl! Well, that's about to change! I'm looking into having a photo printed (possibly the one above) on a rolled canvas from UPrinting.com. I've checked out their website and they make it very easy to place your order...I have a feeling the hard part will be choosing which image of Grace to have printed! In addition to canvas printing, UPrinting also has other great products for all of your printing needs. Products like magnets, brochures, calendars, etc. The nice people at UPrinting are allowing me to giveaway a 16” x 20” Rolled Canvas Print (with or without a 2-inch border) to one lucky Under the Big Oak Tree reader! All you have to do is enter for your chance to win! Note: Please be sure to include your email address so I may contact you should you win! Like UPrinting on Facebook. Leave a comment on this post letting me know you did. 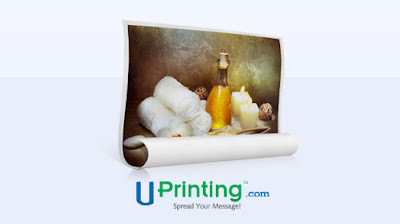 Follow UPrinting on Twitter. Leave a comment on this post letting me know you did. Add UPrinting to your Google Plus Circle. Leave a comment on this post letting me know you did. There you have it! 4 ways to enter to win this great giveaway! This giveaway will run until 10:00pm on May 2, 2012 at which time I will choose a winner via random.org. Winner will have 48 hours to respond to email otherwise a new winner will be selected. You should assume that the owner of this blog will receive free print products in exchange for the post. Any and all reviews posted are based solely on my own experience and may be atypical. Please practice due diligence in making any related purchase decisions.